The 2003 Cheval Blanc, a blend of 56% Cabernet Franc and 44% Merlot, reveals an exquisite bouquet of mulberries, forest floor, new saddle leather, spice box and spring flowers. The first-growth quality aromatics are followed by a complex medium-bodied wine with more density than anticipated. The wine seems fully mature although there is an unexpected freshness and underlying depth of fruit. This beauty should continue to drink well for another 7-8 years. Tasted at Bordeaux Index’s “10-Year On” tasting in London. The Cheval Blanc 2003 has an attractive bouquet with expressive Cabernet Franc – cooked meat, undergrowth, mint and cloves. 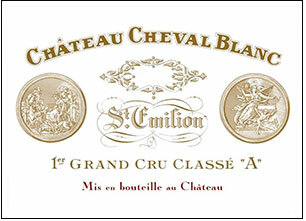 It offers clarity if not the sophistication of a top Cheval Blanc. The palate is medium-bodied with an understated, supple entry of raspberry, dried herbs, cedar and graphite – indeed, quite Left Bank in style for Cheval. It is nicely composed, refined with a sedate low acid finish that fans out nicely. Fine. Tasted March 2013.